Location of Bridgeview in Cook County, Illinois. Bridgeview is a village in Cook County, Illinois, United States. It is located approximately 15 miles (24 km) southwest of the Chicago Loop. As of the 2010 census, the village population was 16,446. Bridgeview is home to the Chicago Fire of Major League Soccer. Bridgeview is located at 41.7424,-87.8068. According to the 2010 census, Bridgeview has a total area of 4.15 square miles (10.75 km2), all land. The village has a roughly rectangular shape; its borders running north and south stagger between 8300 West and 6800 West, but can generally be defined as between Roberts Road and Harlem Avenue. The southern border of the town is 103rd Street between 76th Avenue and Harlem. The northern border is staggered between 6700 South on the west side of the rail tracks and 6900 South on the east side of the rail tracks. Bridgeview borders the following communities: Bedford Park, Nottingham Park (unincorporated Cook County, often considered part of Chicago due to its 60638 ZIP code), Burbank, Oak Lawn, Chicago Ridge, Palos Hills, Hickory Hills and Justice. Bridgeview is 15 miles (24 km) southwest of the Chicago Loop. As of the census of 2000, there were 15,335 people, 5,631 households, and 3,812 families residing in the village. The population density was 3,716.5 people per square mile (1,433.6/km²). There were 5,825 housing units at an average density of 1,411.7 per square mile (544.6/km²). The racial makeup of the village was 87.42% White, 0.82% African American, 0.30% Native American, 2.22% Asian, 3.97% from other races, and 5.26% from two or more races. Hispanic or Latino of any race were 9.42% of the population, including 7.7% of Mexican descent. The top five non-Hispanic ancestries reported in Bridgeview as of the 2000 census were Polish (25.7%), Irish (17.2%), German (15.1%), Italian (9.0%) and Arab (7.2%). In the village, the population was spread out with 24.9% under the age of 18, 9.0% from 18 to 24, 29.6% from 25 to 44, 22.1% from 45 to 64, and 14.5% who were 65 years of age or older. The median age was 37 years. For every 100 females, there were 97.6 males. For every 100 females age 18 and over, there were 93.4 males. The U.S. Postal Service operates the Bridgeview Post Office. Bridgeview was incorporated in 1947 with an initial population of approximately 500 residents. Local residents chose the name "Bridgeview" by one vote over "Oketo", which remains a street name in the village today. The term "Bridgeview" connotes views of the area from the Harlem Avenue bridge, 79th Street bridge and 87th Street bridge. Arab Americans are a growing presence, making up 7 percent of the population in 2000. In 1981, an Islamic social club was established and by 1984 it had become a mosque. Two Islamic schools in Bridgeview educate hundreds of students from K-12. Bridgeview's motto is "A Well Balanced Community", as the village's zoning is divided equally into residential, commercial, and industrial areas. Its proximity to Chicago's Midway Airport and downtown, along with access to major highways, has made it a crossroads of the inner southwest suburbs. Two Indian Springs schools are in the city limits: Bridgeview Elementary School and Lyle Elementary School. Residential areas of the North Palos School District section are zoned to Dorn Elementary School, Glen Oaks Elementary School, and Conrady Middle School; all three schools are in Hickory Hills. Residents are zoned to Lieb Elementary in Bridgeview and Simmons Middle School in Oak Lawn. Moraine Valley Community College serves area residents. The Bridgeview Public Library serves residents of the village. Bridgeview has become the home of the Chicago Fire professional Major League Soccer team, whose stadium was funded by the village of Bridgeview and is operated by the village. SeatGeek Stadium is home to not only the Fire, but also the Fire Reserves, Bridgeview Fire Premier, and the Chicago Red Stars of the National Women's Soccer League. Toyota Park hosted the 2006 Major League Soccer All-Star Game, and continues to be a premier venue for important concerts. The village has developed a plan to have a mixed commercial and residential zone near the stadium to give the town a commercial and residential hub near the stadium. Development has not yet been approved. Numerous self-owned businesses create an atmosphere similar to that of some Arab diaspora communities across the world. Businesses include ethnic grocery stores (containing imported groceries and appliances used to cook regional dishes, cultural souvenirs, and calling cards used specifically for customers to use when speaking to relatives overseas), hookah lounges, and Middle Eastern sweet shops. The majority of Arab business owners on Harlem Avenue are from Palestine and Jordan. Mark Barnett, Professional Motocross Racer. Born in Bridgeview. ^ a b "Profile of General Population and Housing Characteristics: 2010 Demographic Profile Data (DP-1): Bridgeview village, Illinois". U.S. Census Bureau, American Factfinder. Retrieved February 15, 2013. ^ Michaels, Marguerite (2005-06-11). "The Model School, Islamic Style". Time. Retrieved 2017-01-18. ^ "Profile of General Demographic Characteristics, Bridgeview, Illinois" (PDF). Archived from the original (PDF) on 2007-07-04. Retrieved 2007-03-30. (39.0 KiB). U.S. Census Bureau. Accessed 2007-03-30. ^ a b "Public Services." Village of Brigeview. Retrieved on January 19, 2017. ^ a b c d e "Schools." Village of Bridgeview. Retrieved on January 18, 2017. ^ Home. Bridgeview Elementary School. Retrieved on January 18, 2017. "7800 South Thomas Bridgeview, IL 60455"
^ Home. Lyle Elementary School. Retrieved on January 18, 2017. "7801 West 75th Street, Bridgeview, IL 60455"
^ a b c "Zoning Map." Village of Bridgeview. Retrieved on January 19, 2017. ^ "Boundaries." Ridgeland School District 122. Retrieved on January 19, 2017. ^ "Attendance Areas." Consolidated High School District 230. Retrieved on January 19, 2017. ^ Brent Bowers Baseball Stats by Baseball Almanac Retrieved 2017-02-18. ^ "National Geographic Snake Wranglers. On February 10, 2013, Jurisch was recognized as the top in his field by a peer review, being honored on the "fan cam" of the NHL's Predators vs. Blackhawks game". National Geographic. Retrieved 9 August 2012. 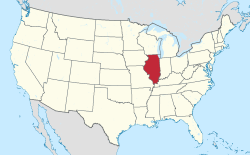 Wikimedia Commons has media related to Bridgeview, Illinois.